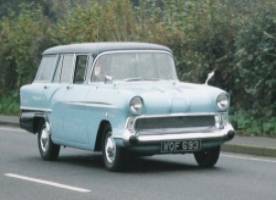 Just over a year after the launch of the Victor Saloon, March 1958 saw the introduction of the estate version of the car. Somewhat of a mystery surrounds the reason for the delay in the car’s introduction and this is borne out by the fact that an example was seen in Bedfordshire in the middle of 1957. Clearly, an estate version was firmly in the minds of the Vauxhall design team from the word go, but two further factors may have contributed to the asynchronous launch of the saloon and estate. Firstly it is well documented that pressure was coming from Detroit to bring forward the launch of the saloon, which took place in February 1957. 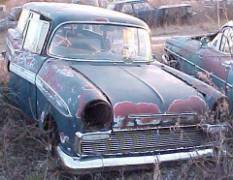 That pressure may well have been of sufficient magnitude to render the simultaneous or earlier than 1958 introduction of the estate version impossible. 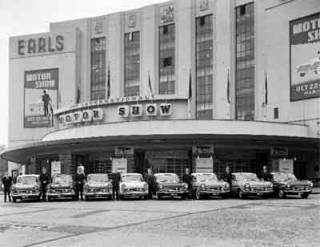 Secondly, there occurred in October 1957 the launch of the new six cylinder ‘PA’ series of Velox and Cresta cars in time for the motorshow of that year at its traditional home of Earls Court. Dilution of the impact might thus have been a large contributory reason. Be that as it may, the car was launched in March of 1958 coincidentally with the availability of the Newtondrive semi automatic two pedal control transmission system, which involved the clutch being operated by the driver’s contact with the gear change. This was a short-lived option due to its complexity and being unreliable and cost £17 plus £8.10.0 Purchase Tax. Shaw & Kilburn in London would even throw in a Handa overdrive if that were your fancy. It is useful to briefly consider the evolution of the estate car idea in Britain. It can be argued that the idea really took off after the second world war and would probably have been considered as the equivalent of what is the multi purpose vehicle today, i.e. a vehicle combining the virtues of a family car and one able to carry out a variety of duties of a utilitarian nature. This type of vehicle would have been a particularly attractive proposition in parts of the world used to large tracts of open space such as North America and Australia where hunting, shooting and fishing were popular pursuits, the vehicle being used to transport the necessary equipment as well as the spoils. It is interesting to note that there are a larger number of surviving 1958 estates in North America than in the UK, but it is not clear whether this is a function of a greater number being sold there than the UK or the climate being more conducive to longevity. Britain tended to follow America in many areas, and thus not surprising that the merits of such a car began to be appreciated here, and many of the coachbuilding firms who had already seen a decline in their business, offered conversions using the saloon as the starting point. Vauxhall’s previous E series models were available with this option on the 1956/7 as an outside job and confined to the Velox range, though the customer had a choice of two styles. 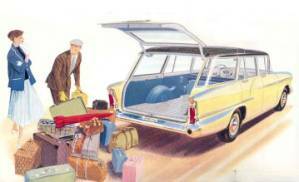 Both were stock saloons to the rear doors, and the cheaper by a few pounds was the Martin Walter’s Dormobile. You could actually sleep in it, by folding down the seats. It was aesthetically more attractive than Grosvenor’s which only needed a coat of black paint to make it look like a hearse. Both options were backed with a full Vauxhall warranty. The disadvantages of the saloon conversion route were several. It involved major alteration to the saloon body which could easily affect rigidity and overall strength, restricted use of the existing rear doors, was time consuming and resulted in a comparatively high price to the customer for a vehicle that found it difficult to disguise its origins and gave it a compromised appearance. Some conversions worked noticeably better than others. The system probably worked better for the original manufacturer, meeting the demand for such vehicles versus the investment required for tooling up for that demand. Other manufacturers from Britain had gone the ‘van with windows’ route, or developed wooden framed bodywork built onto a chassis/cab unit. What was becoming clear was that to satisfy the aspiring family man in his pursuit of further enhancing his leisure activities was a purpose built, factory produced estate car. With successful marketing it could be a valuable money-spinner. 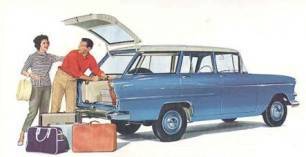 Delayed or otherwise, when the Victor Estate was launched it was deemed an especially attractive vehicle that had overcome all the previously mentioned limitations. The overall appearance was remarkably pleasing. This was undoubtedly helped by the fact that the original rear doors could be simply changed by substitution of squarer window frames to mate up with the rear three quarter windows which on the saloon are curved to reflect the panoramic windscreen at the front end. The high lifting, spring assisted rear door which sported the same badge as the saloon, and borrowed the handle from the CA van parts bin, opened up onto a cavernous load area. With the rear seats folded down flat on the raised floor area that sat just above the original boot floor pan, there was over four and a half times the capacity of the saloons trunk space. The low sill loading height was right and when the rear door was closed the rake of the rear screen promoted clear rear vision even in the rain, as well as an integrated clean looking rear end appearance. Other modifications included an additional leaf in the rear springs, heavier duty, lower geared rear axle (4.625:1 compared with 4.125:1 for the saloon) and stronger and wider tyres (590 x 13 Cross Ply) and was essentially similar to the saloon. In March 1958 the Victor Super saloon was selling for £781.7.0 including Purchase Tax, (an increase of £20.10.0 on the Launch price a year earlier) and the Victor Estate was priced at £931.7.0 including Purchase Tax. The kerb weight was 2300lb for the estate compared with 2170lb for the Super saloon, and the first estate car was chassis no. 80660 and referred to as the FW model. Top speed was 73 mph compared to 79 mph for the saloon, with a cruising speed of 50 mph. The series II estate model was launched concurrently with the saloon model in 1959, giving only one years production for the series I estate. Series I (1958) estate cars are extremely thin on the ground today. There are four within the club with only seven others of the series II or ’61 variety. There is only one known to be on the road in the UK at present, WOF 693 currently owned by Shane Portman. As this article is being written, there is another owned by Aubrey Pitts of Teignmouth, Devon that will be on the road very shortly. I have pictures of at least another four series I estates in North America as well as one in Norway, and know of at least another one in the UK that is not a club member. The rarest of the rare must be the Envoy Estate built for the Canadian market.